Finally, the professor left for work, locking the door to his apartment behind him. I waved goodbye as the bus into the city pulled away from the curb, then grabbed my keys and my new portable camera. I had work to do. You see, the professor has been seen moving in suspicious circles. As the manager of our building, it is my job to keep tabs on my residents, to protect them from insidious influences and to help them better serve our glorious nation. I have been tasked with gathering evidence against the professor on behalf of the police. I will install the camera into the single, pathetic light fixture in the center of the ceiling of the meager, dirty one-room unit. Then I can monitor his activities from the safety of my office. A few weeks later, I am feeling a great deal of pressure. The professor hasn’t yet been caught doing anything especially seditious on camera. Sure, he occasionally partakes in illegal substances and he possesses a few books by authors who have been declared enemies of the state, but the “smoking gun,” as they say, has yet to make an appearance. The prefect of police has informed me that I am to produce conclusive evidence of the professor’s treason within a week or I risk facing charges myself. I can’t allow my family to lose their home, their reputation, their safety. I need to come up with something fast. Perhaps I should come forward with a document of these smaller sins? Maybe that would keep them off of my back for a little longer. Or should I simply use my access to his apartment to manufacture the scene they seem so intent on discovering? 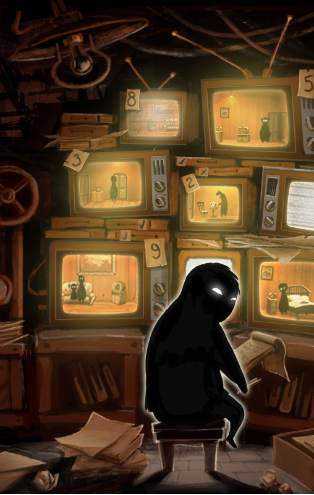 Beholder by Warm Lamp Games is, in spite of its name, a game about choices. You play as an apartment manager living in a totalitarian regime tasked with monitoring your tenants on behalf of the government. When you arrive at your dirty, dingy building, you and your family watch anxiously as the previous manager is escorted out by the police for failing in his duties. The implication is clear: the police require your complete loyalty. You can’t afford to let any of your tenants slide or you will become the target of the system yourself. So you set up your secret surveillance cameras and peek through keyholes and let yourself into their homes uninvited so search for contraband. And yet, from the game’s first moments, the player finds themselves becoming enmeshed in the lives of their neighbors. One of them lends you a casserole dish, or offers to lend a textbook to one of your children. Then, a few days later, you’ll be asked to gather intelligence on them. Do you risk trying to help them, or fulfill your duty? Will you be able to live with your decisions? Will they? As I played through the Beta version of the game (available for free here), I was struck by another consideration: my own curiosity. I simultaneously recognized the injustice of my amateur spy work and felt entitled to uncovering all of my tenant’s secrets. As my avatar walked the hallways of his building, I strained forward in my seat at my desk, putting my face up close to the computer screen and searching for clues to the private parts of their lives that they were unwilling to share in conversation. I didn’t want to do them harm, in fact I am a notorious goody-two-shoes when it comes to video games with moral choice mechanics. But I also didn’t mind invading their privacy, especially when I could convince myself that it was for their own good. I might have objected to my dystopian government’s choice of targets, but I realized I was happy to employ their methods for my own purposes. In that sense, Beholder is something truly amazing: a game about ethics that actually made my second guess my decisions, a game that I am still thinking about days after my experience with the demo was over.